When we embarked upon the quest to produce a new British gun, we realised the need to make it ‘innovative’ and ‘advanced’ whilst maintaining classic lines. For this reason in 2006 we thought very carefully about the design and processes from initiation. Our patented barrels are designed and manufactured in house by a highly innovative method and process. We take a single piece of high specification steel weighing approximately 27 kg and machine the barrels from this single block of steel eventually weighing approximately 1.3kg depending on their length. This has a number of benefits. The resulting barrels are not only strong, but also light in weight. In eliminating the need for a heavy soldered centre rib we are able to add weight to the barrel wall thickness, which in itself is stronger than the average barrel because of the high specification material we use. Despite its light weight our barrels are chambered for 3”(in 12 and 20 bore) and can be proofed for Magnum steel( also known as Fleur De Lys or Superior steel proof) up to full (fixed) choke. 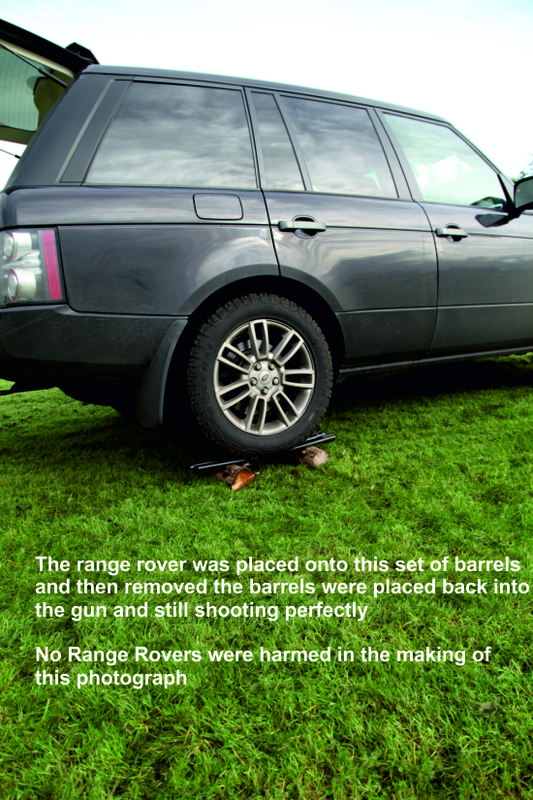 We believe that to date we are the only gun making company in the UK (at least) to have achieved this. Not only does this verify the strength of our barrels, it renders them 'futureproof' for our Clients. The small central i-beam between the barrels measures less than 2mm, and this, combined with the fact that our barrels are honed to a very fine tolerance and are perfectly straight not unlike a finely tuned rifle, results in our guns shooting exactly where they are pointed and no need to regulate them. In contrast to this, many conventional monoblock barrels are constructed from two tubes which are inserted into an angled cavity at the breech end and then ‘pulled’(or ‘pushed’) together and then soldered into position, which in itself can cause heat distortion and softening of the base metal, meaning that they are in effect are not perfectly straight, comparatively, This can mean that the ‘shot’ is effectively being forced around a bend resulting in an increase in ‘felt recoil’. The most significant feature of our guns is that they have negligible recoil even with the heaviest loads, we quite often demonstrate the guns capacity using 50 gram 4's, this is attributable significantly because of our barrel design, but also our low profile action and general rigidity of our guns, this also minimalizes 'muzzle flip'. We are able to tailor the barrel length and the top rib to your requirements during the manufacturing process and can incorporate a rib more suited to game or clay shooting , whichever you prefer, we are also able to adjust the weight of our guns whilst maintaining balance. We are also able to use a ‘hot’ process to blacken our barrels because there are no soldered ribs and therefore no ‘seepage’ of chemicals which can cause premature rusting of soldered joins. This process is more resilient than the cold blacking process so often used on fabricated barrels and creates a wonderful blue/black sheen. Another significant benefit with Longthorne barrels is that they are parallel and, unlike converging barrels which often shoot apart after the point of convergence, our barrels ensure a consistent point of aim/point of impact. Eliminating the centre rib also allows any heat to disperse more evenly and quickly, we don’t need a vented rib because there is no trapped hot air causing heat ‘build up’. Because our barrels are made from a much harder material than conventional barrels (such as EN19T or EN24T for example), they are much less likely to ‘dent’ in the event of an accident, however, should a small calamity occur, dents can usually be ‘raised’ in the normal manner but without having to remove the ribs. Our theories aren’t new, and in fact the renowned engineer Joseph Whitworth (of ‘Whitworth’ thread fame) recognised the benefits and patented barrels manufactured from a single piece of steel in 1857, unfortunately, at that time the manufacturing methods were expensive in comparison to labour costs of the day and cumbersome in comparison to today’s available technology, and so the fabricated method of making barrels prevailed at that time. Our reviews verify this, but don’t take our word for this, we actively encourage shooters to try our guns for themselves. Please contact us if you would like to arrange this.